This post comes with a warning… it’s the first time I’ve actually had a go at writing down a pattern. Well not a whole pattern, just for the edge of a blanket. And I’m doing it from my memory (not very reliable!) and from looking at the blanket and the photos. So… consider yourself warned! The blanket in question is my Cool Rainbow Blanket. The blanket is all granny stitch and the edge consists of 3 rows. And I’m going to explain the first row in a bit of detail first, with the help of some pictures then go on to the whole edge pattern. The first row is a double crochet, chain one. Now where you put your double crochet is the important bit. It needs to be spaced out in a way that gives you a flat edge. Not one that ends up with too many stitches… which is what I seem to do. Often. I find when following a granny stitch blanket, along the top and the bottom edge of the blanket, it’s simply into every second stitch. But do note that I finish my granny blankets with a row of single crochet as that’s how they start out… so we’re all nice and balanced…. top and bottom wise. It should look like the picture above. Along the sides of the blanket I find it best to do the double crochet in each granny stitch row. Like this picture above. 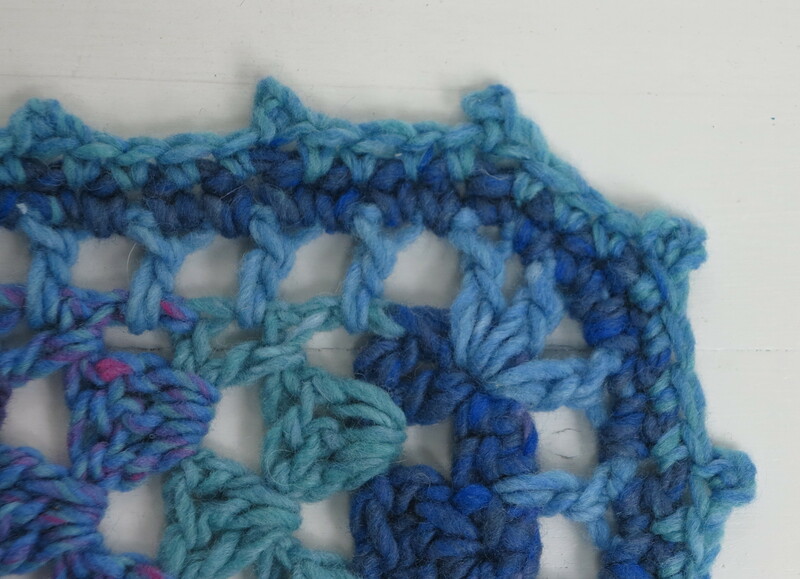 The chain stitch after the double crochet works as a nice spacer and seems to fill the space nicely without creating too many stitches. For the corners I do a ‘double crochet and chain one’ x 3 times. Like my corner above. It’s a slightly rounded corner which I tend to favour. Now for the whole edge pattern. Ready? Starting anywhere around your blanket chain 4, *double crochet, chain one. 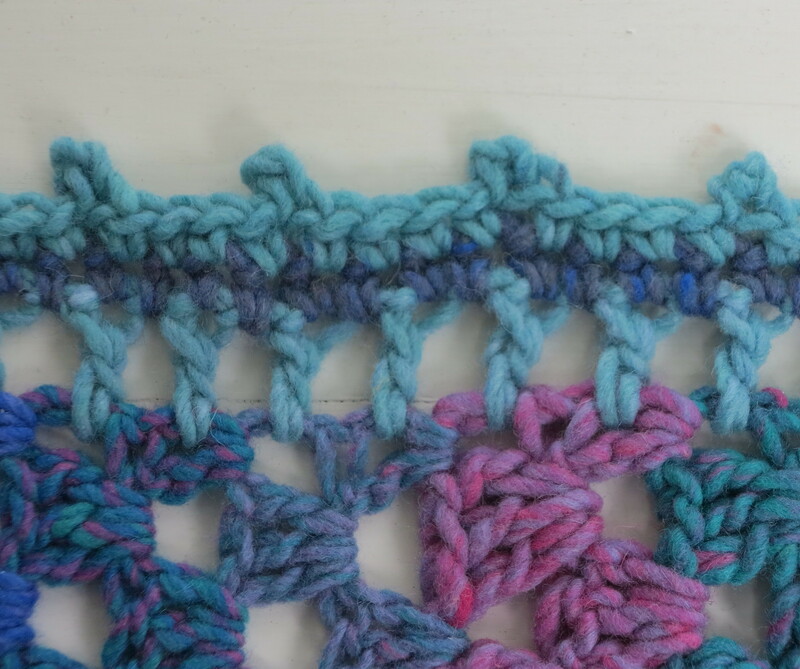 Repeat from * all the way around the blanket, then slip stitch into the 3rd chain at the beginning of the 1st row. 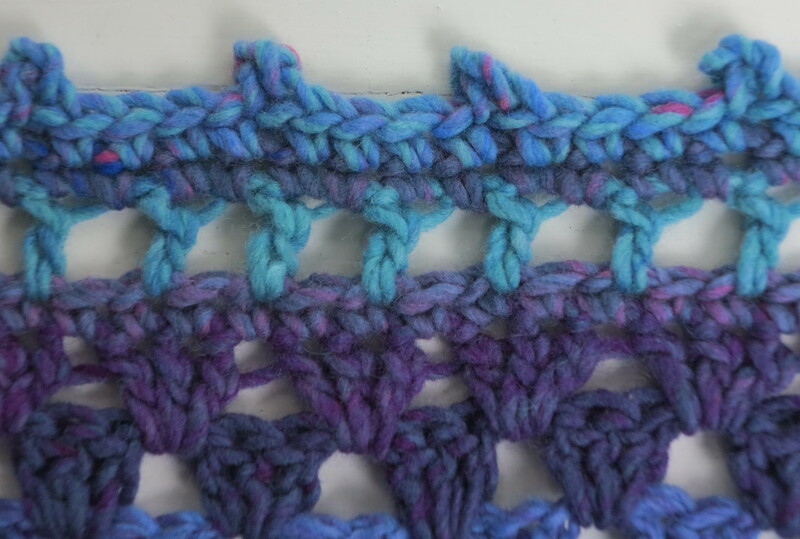 Chain 1, *single crochet into each stitch. Repeat from * all the way around the blanket, then slip stitch into the 1st single crochet of the 2nd row. Chain 1, *single crochet into the next 4 stitches, chain 2 then do a single crochet into the 1st chain. Repeat from * all the way around the blanket then slip stitch into the 1st single crochet of the 3rd row. The chain 2 & single crochet into the 1st chain forms the cute little picot/bump/bobble along the edge. Hope that makes sense and I haven’t confused you. It is a simple little edge that gives an effective finish and I hope I haven’t complicated it in my ‘pattern writing’. Seems almost a bit ironic that I find myself writing a pattern when I don’t use them much myself, although I have started to a lot more lately. Well that’s my excuse anyway and I’m sticking to it. Oh and I almost forgot, my terminology is US crochet so you’ll need to convert to UK if that’s your lingo. Do let me know how you go with it if you try it out wont you? May your days be ‘edgy’ in the best possible way! 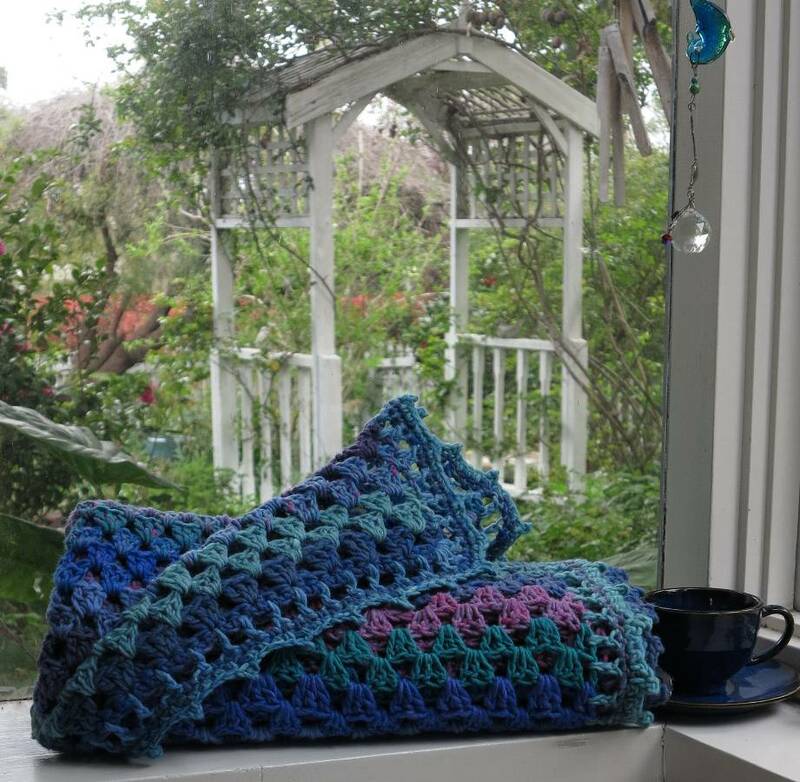 This entry was posted in crochet, pattern, Uncategorized and tagged blanket, crochet, double crochet, edge, free pattern, granny stitch, pattern, single crochet. Bookmark the permalink. oh thank goodness I found your “before” spot, was afraid I had lost the contact for your lovely edging. I am one row away from a linen stitch crochet afghan completion and wanted to review your precious edging and see if I could maybe do it with this afghan. My granddaughter (age 9, the only one too, the rest are boys) spied me working on the afghan and asked who it was for…when I replied no one, she said “well, I love this one Winnie”….so want to add a girlie edging you see. Don’t you love that Winnie? Oh I do and they named me that all on their own. I have to tell you…..for Christmas she painted me a very special picture…..we have this little thing that goes something like this as we part….me: I love you, her: I love you more, me: I love YOU more, her: I love you some odd ball number she makes up more, me: gosh that’s a lot…..so On a rectangular black canvas in red berry paint she made a huge heart and wrote I love you and her odd ball number, more…..love Bryleigh…..it’s my second favorite Christmas present ever! I hope your Christmas as well as your New Year were great…..a farm!!!!!! Wow…..fresh eggs, wool….I must do some catch up reading on your blog. Hopefully that link will take you to the picture of me and Bryleigh with her lovely painting with her made up numbers. aw the link didn’t work Becky… sounds like such a cute painting!